One of the (many) new features that the Windows 8.1 Update -- out today -- adds to the OS is a PC Settings tile. This tile opens the PC Settings screen, saving you having to go through the Charms, and provides access to settings for PC and Devices, Accounts, OneDrive, Search and Apps, Privacy, Network, Time and Language, Ease of Access, Update and Recovery and, most importantly, Control Panel. It also lets you personalize the Lock screen, your account picture, access the Picture Password and view recently used settings. The tile is available in the Apps screen, but isn’t displayed on the Start screen by default. It’s a very handy tile, so well worth making easier to access. Either browse for it, or type "Settings" from the Start or Apps screens. Right-click the tile and select Pin to Start. You can also Pin to Taskbar. 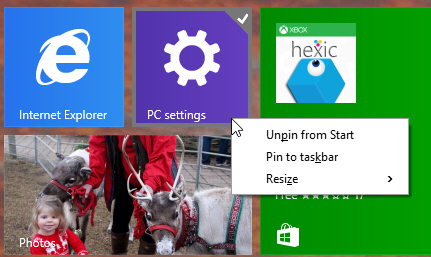 By default the tile on the Start screen is medium sized, but you can make it smaller by right-clicking it and going to Resize in the new context menu.